Can we make meaning out of Creation? Does revelation have relevance? Should we abandon providence? Can we talk truthfully about God? 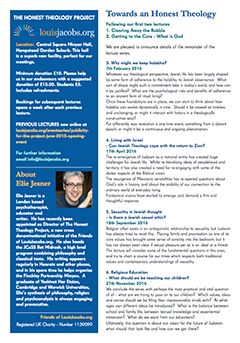 Friends of LouisJacobs.org is excited to announce the launch of a new series of educational events, aimed at re-invigorating religious discussion in our communities. True to the spirit of Louis Jacobs, the aim is to plumb the depths of our traditions with both respect and rigour, believing them to be a significant source of wisdom for the modern age. The project is inspired by a need to strengthen the intellectual dimension of religious life. Whilst communal practice and ethical conduct are to be celebrated, there is a sense in which there needs to be an intellectual foundation upon which to build a strong and enduring religious culture. Some have abandoned this cause, perhaps feeling the obstacles to be insurmountable. Others have shied away, afraid of what serious investigation might make of their faith claims. But we believe that rich rewards await those who can skillfully walk this tightrope, and hope to catalyse this process through bringing together the best religious minds of our times.